Spaghetti Squash "Lasagna" - AV Show 15 & Good News! Spaghetti squash, homemade sauce and vegan cheese make this meal a WINNER! Layers of incredible flavors bake together in the oven and come out begging to be eaten. The smell alone is enough to make you quiver! When you bite in, it is pure magic! Comfort food to the max without all the unhealthy fat and calories. Sign me up! Are you ready for this? The good news? I have a whole batch in the fridge. 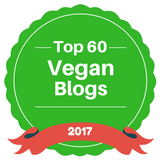 The REALLY good news is ArtisticVegan.com made the Top 60 Vegan Blogs to Follow for Inspiration in 2017! So you are in the right place my sweet friends! This only inspires me more and I hope to not fall short on bringing you inspirational yet good eating!! Speaking of which, I strongly encourage you try this new recipe and let me know if you love it as much as we do. Get the recipe below and / or in the new Artistic Vegan Show 15, where you can join me in the kitchen. 1 Spaghetti Squash - Roasted, Inside Scraped & Excess Water Squeezed Out (about 3 1/2 cups after it is roasted and squeezed). Prepare your squash first, directions in the notes. If using store-bought sauce and vegan cheese skip steps 2 and 3. Make your sauce, you can even make this ahead of time. Or use store-bought and pass this step. To make the sauce, sauté the onions and garlic for 3-5 minutes until fragrant. Add the seasoning (less the fresh herbs) mix for 30 seconds. Add the tomatoes, cook for 15 minutes until they break up. Then add the tomato paste. Cook for 5 minutes to loosen up. Add fresh herbs if using. Leave it chunky or use an immersion blender or heat proof blender to blend until smooth. Set aside. Feel free to add any "beef" see tip below. If making your cheese, blend all the cheese ingredients together. Heat in a small pot over low-medium heat for 3-5 minutes, until desired consistency. Moving constantly. Remove from heat. Preheat your oven to 375°F / 190°C. Lightly grease a 9 x 13 baking dish. Spread enough sauce to cover the entire base of the baking dish evenly. Take 1/2 of the roasted and drained spaghetti squash mixture and spread it on top evenly. Take 2/3 or 2 cups of the basic cheese sauce or your favorite vegan cheese and spread that on top. Spread an even layer of the remaining squash on top of the cheese layer. Spread the balance of the sauce on top of the squash layer and finish with the balance of the cheese. Cover and bake for 20 minutes. Remove the cover and bake for 10 minutes, feel free to increase the heat a little for the last 10 minutes for a more golden color. Remove from oven. I like to wait 10 minutes and then slice so it holds a little better, it holds beautifully the following day or once it has cooled. Serve with a salad and bread or as you desire!! Make it "Beefy": Add 1 lb of beefless crumbles or TVP. If using TVP it is equal parts TVP to water, season as desired. Soak for 20 minutes and then add to your sauce for the last 5-10 minutes. Continue as normal . Slice the ends off your squash, carefully. Slice it in half. Scoop out the seeds until it is nice and clean. Lightly oil, place face down on a parchment lined baking sheet. Roast at 400 degrees F for about 45-60 minutes depending on the size, once you can pierce it with a fork, remove from the oven to cool. Once cool, take your fork and scrape the inside out, making noodles! Then with a cheesecloth, nut-cloth, clean handkerchief or thin kitchen towel, place the spaghetti squash noodles in the cloth and squeeze out all of the water. Give it a very good squeeze. You'll want to have 3-4 cups after it has been squeezed. Mine came out to 3 1/2 cups. I reserve the liquid to use when making vegetable broth. Save a dish and make it in the shell of the spaghetti squash! You can decrease the salt and control the fat but which plant-based milk you use when making the cheese sauce.